New Jersey Charity Opens Soup Kitchen Expansion in Time for Thanksgiving. Eva’s Village, a Paterson, NJ anti-poverty nonprofit expands soup kitchen program to accommodate increase in demand. The soup kitchen program at Eva’s Village, New Jersey’s most comprehensive anti-poverty organization, has experienced more than a 20% increase since 2007 in the hungry and homeless coming for a hot mid-day meal. The need has grown to such an extent that Eva’s Village found it necessary to increase the capacity from 240 seats to 400. Although it has taken several years, the expansion of Eva’s kitchen is finally completed and has been opened just in time for Thanksgiving. Support and donations to Eva’s Village helps supply a meal at Eva’s Kitchen to many and much more as well. As Executive Director Sister Gloria says, “With just one donation to Eva’s Village, a donor can feed hundreds of hungry people in New Jersey during Thanksgiving which is such a special time to give thanks for all the good in our lives and makes a very real difference in the lives of the poor”. At a recent noon meal provided at Eva’s Kitchen, some 350 men and women gathered in a large courtyard before Eva’s Kitchen doors. The mood was friendly, with some clients who have been coming to Eva’s Kitchen for years, but many new faces as well. When lunch was ready to be served, people were invited into a large airy space filled with light and seated at long tables set with utensils, bread and dessert. After a grace was offered, volunteers served their guests generous helpings of baked chicken, rice and mixed vegetables. After the meal, coffee was offered. This was not the typical soup kitchen scene, with chow lines reinforcing the indignities of being homeless. 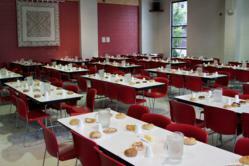 Here, the poor were treated as guests and served dignity along with their food. Through relationships formed from interactions with the staff, guests at Eva’s Kitchen learn of the many resources that are available to them at Eva’s Village and may choose to take the next step – whether it is a shelter, drug/alcohol recovery, primary medical and dental care and/or Recovery Center activities. Sister Gloria notes that the funding for Eva’s Kitchen and all the programs at Eva’s Village depends on volunteers and the financial support of donors and is emphatic when explaining that donations are used with great care. For verification, she points to Charity Navigator, America's premiere independent charity evaluator, which has awarded it’s highest rating (four stars) to Eva’s Village for five consecutive years, indicating the organization adheres to good governance and other best practices that minimize the chance of unethical activities and consistently executes its mission in a fiscally responsible way. Founded by Msgr. Vincent E. Puma in 1982 as a response to the poor and homeless in Paterson, New Jersey, Eva’s Village (http://www.evasvillage.org) is a non-profit comprehensive social service organization with a mission to feed the hungry, shelter the homeless, treat the addicted and provide medical and dental care to the poor with respect for the human dignity of each individual. Through almost three decades of service, Eva’s Village has established a commendable record in facing community challenges and changing the lives of the hungry, homeless and addicted. Eva’s Village has grown from a simple soup kitchen to become the most respected anti-poverty program in the state of New Jersey and now includes fourteen integrated programs housed in numerous buildings spanning several city blocks in downtown Paterson. 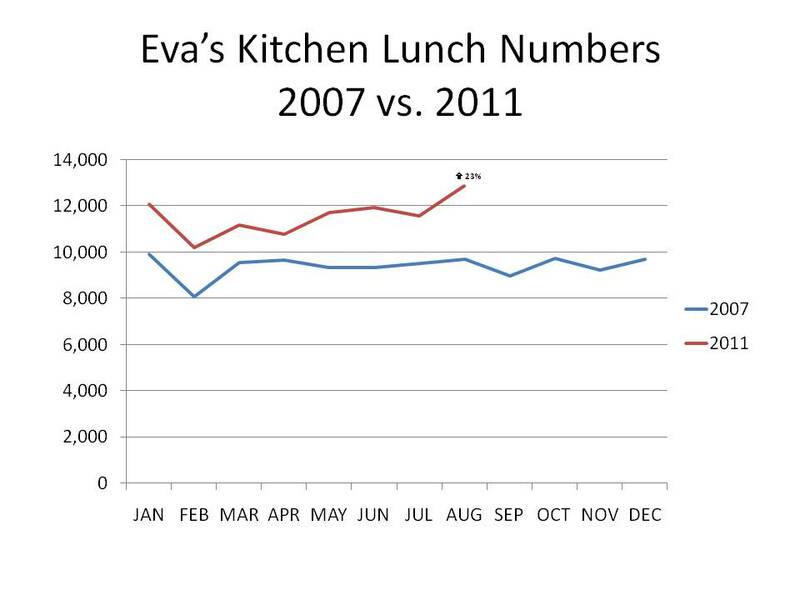 To learn more about Eva’s Kitchen and all the programs at Eva’s Village, or to donate or volunteer, visit http://www.evasvillage.org.